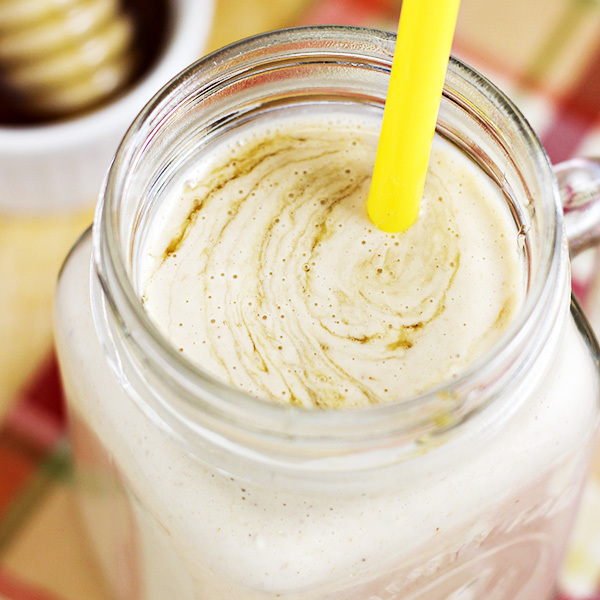 A Peanut Butter & Honey Oat Smoothie Recipe with Banana that will keep you feeling full longer, plus gives you a beneficial boost of fiber. It’s also a great way to take breakfast on-the-go. David made a comment to me recently that we had never made a smoothie with peanut butter. I thought he was wrong, but after thinking about it, I realized that he was totally right. It was somewhat unusual since peanut butter is favorite flavor for both of us. That comment was all it took for me to correct the situation. It’s pretty much how it works in our house. 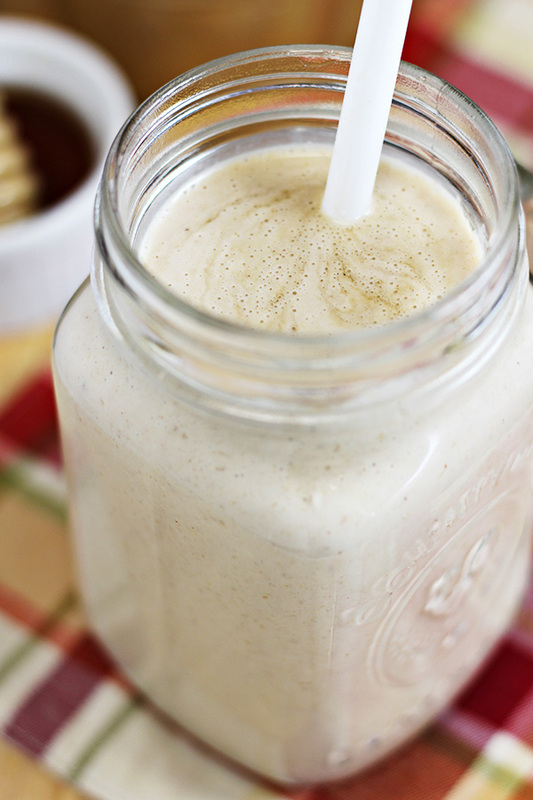 Because of my love of both Peanut Butter & Honey Sandwiches AND Peanut Butter & Banana Sandwiches, I knew that a blend of all three would make a perfect smoothie. Deciding on my smoothie base was the biggest question though. I’ve made enough smoothies that I know what I like and what I don’t like. For example, I tend to avoid yogurt based smoothies because I’m not the biggest yogurt fan. While I have made them, and I absolutely LOVE my Strawberry Mint Smoothie (made with yogurt), but that would be one of the exceptions. 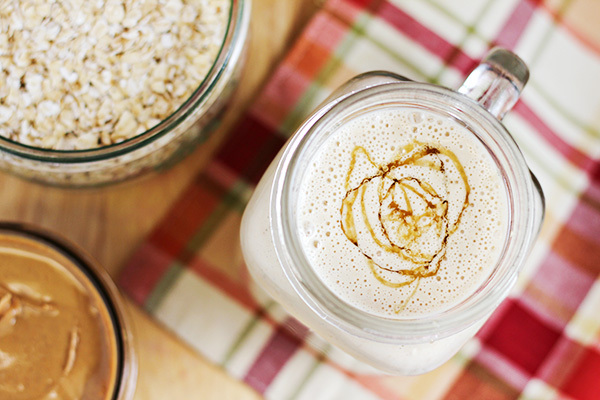 There was one ingredient that I hadn’t used in our smoothies yet: oats. When I first heard about oats being added to smoothies and other beverage, I’ll be honest, I thought it sounded disgusting. Yes, I love oatmeal, but it’s already mushy and you hardly have to chew it. Now we’re drinking oats?? The world has gone mad. But, hear me out: I’ve tried it and I like it. Seriously. 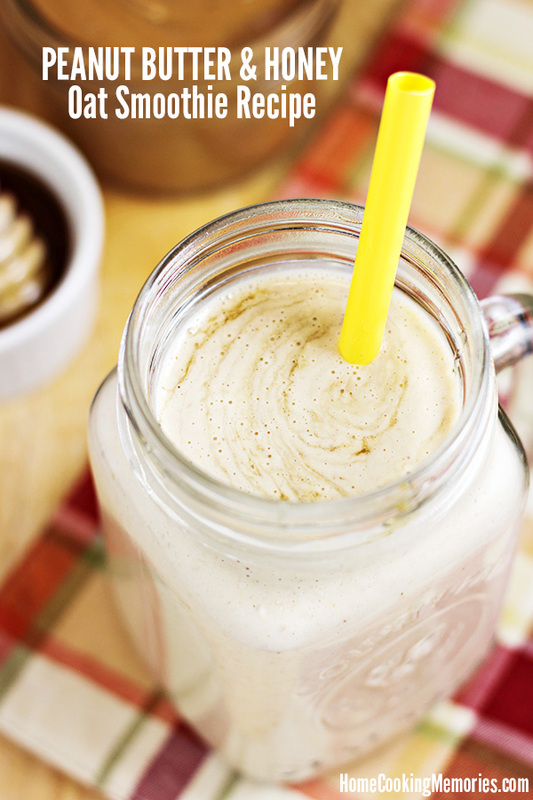 While it’s not my #1 go-to for smoothies, it does work and it’s a great fit for this smoothie with peanut butter, honey, and banana. Also, this oat smoothie recipe has the added benefits of keeping you full longer and giving you an added boost of fiber. Plus, if you have limited time in the morning, this is a great way to take breakfast on-the-go. There is one trick I insist on when making an oat smoothie: pulverizing the oats first. I love how the oats thicken my smoothie, but I also don’t want large pieces of chewy oats. I make all of our smoothies in our Ninja Blender, so I do this right before making the smoothie. I put the oats into the blender and pulverize it. 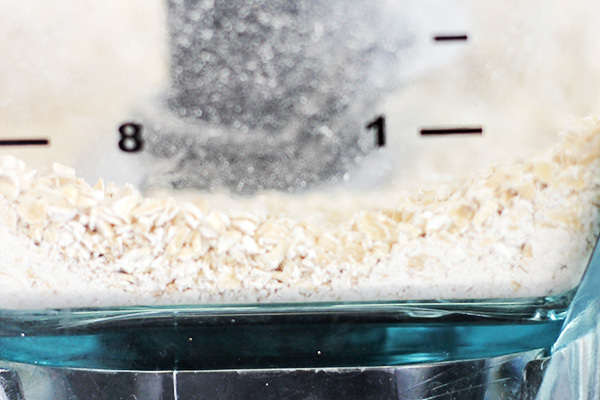 Many blenders will have no trouble doing this to a small amount of oats, but you can whirl them in a food processor, if you prefer. After the oats are broken up, add your almond milk (or other milk of choice). Let the milk sit for a couple minutes, which helps the oats to soften and soak up a bit of the milk. 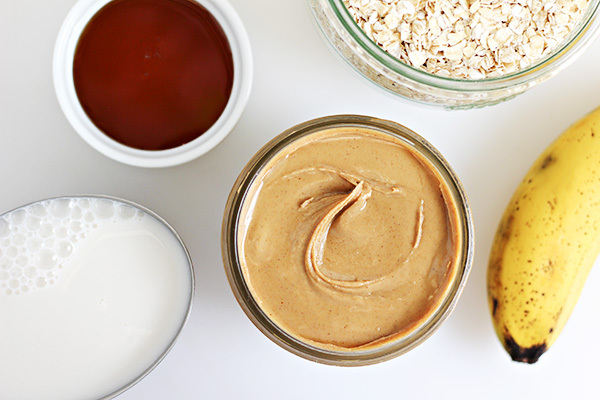 During this time, grab the rest of your oat smoothie recipe ingredients and start adding them to the blender: peanut butter, banana, and honey. 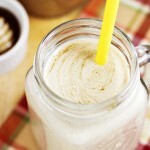 Then, blend and enjoy your Peanut Butter and Honey Oat Smoothie! Below is the full recipe, ready for you to print. If you aren’t ready to make this yet, be sure to save to one of your Pinterest boards so you can find it easier later. 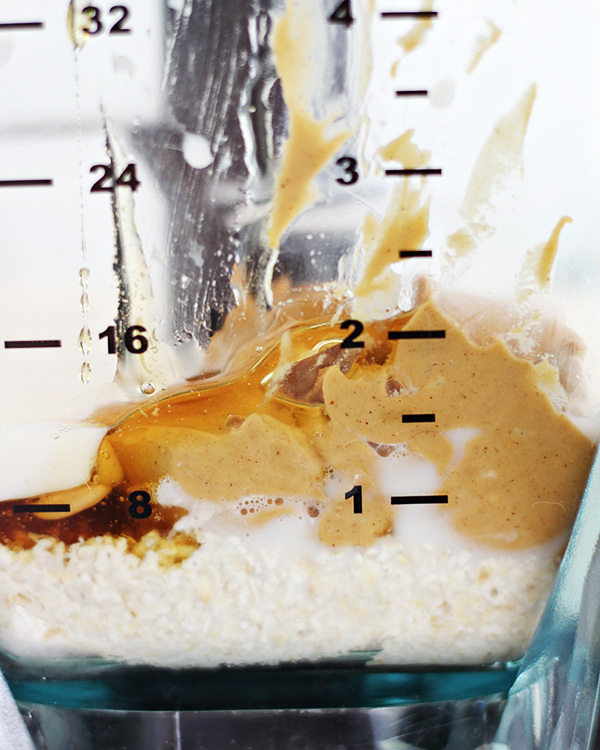 Place oats in blender and process/blend to pulverize them. 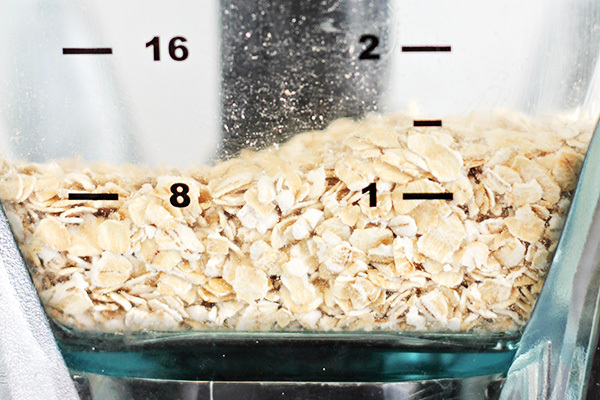 Pour milk into blender and allow oats to soften in milk for about 2-3 minutes. Add remaining ingredients and blend until smooth. Serve immediately. Feel free to adjust ingredients based on your own personal preference. If smoothie is too thick, add more milk. If you wish it to be sweeter, add more honey. Want more fruit smoothie recipes? Yummed! I’ll make this one for my honey. He loves peanut butter based smoothies. Thanks for sharing with us at Funtastic Friday.